Gwanghaegun or Prince Gwanghae (1574 – 1641) was the fifteenth king of the Joseon Dynasty. His personal name was Yi Hon (李琿). He came to the throne amid controversy over his birthright. He did much to stabilize and rebuild the country during his 15 year reign, but was unable to control the actions of the court faction that backed him, and their violence against the former Queen and young prince led to retaliation by a rival faction, which forced him from power. Since he was deposed in a coup, later official historians did not give him a temple name like Taejo or Sejong. He was married to Lady Ryu (부인류씨 ; 夫人柳氏). Gwanghaegun endeared himself to generations of Koreas for guiding Joseon Korea through one of the most perilous periods in Korean history. Leading Joseon in place of his king father in hiding during Japan's invasion of Korea, rebuilding Korea in the wake of that devastating war, and dealing with Korea's role in the Manchu-Ming War, Gwanghaegu distinguished himself in the tradition of King Sejong and Yi Sunsin. Gwanghaegun, or Prince Gwanghae, was the second son of King Seonjo, born to Lady Kim, a concubine, while Seonjo's Queen, Euiin, remained childless. Seonjo had sent both Prince Gwanghae and his elder brother Imhaegun (Prince Imhae, 臨海君), also a son of Lady Kim, into battle to test their leadership abilities, and when the younger brother, Prince Gwanghae, proved a much superior leader, King Seonjo appointed him Crown Prince. When Japan invaded Korea to attack the Ming Empire, the king fled north to the border with Ming, and Crown Prince Gwanghae remained in the capital, operating the central government in his father's absence and leading defensive battles. During and after the Seven Year War (1592–1598), he acted as de facto ruler of the Joseon Dynasty, commanding battles and taking care of reconstruction of the nation after the devastating war in the place of old and weak King Seonjo. Throughout the Joseon period, Korea was still under some control by China, and the Chinese court objected to Gwanghae's appointment as Crown Prince, because his elder brother was still alive, and more eligible by birthright. Seonjo petitioned the Chinese court to make an exception and approve the choice of Gwanghae, based on his superior abilities, but China refused. A solution presented itself after Queen Euiin died in 1600, and Seonjo took a new Queen, Inmok. Yeongchangdaegun (Grand Prince Yeongchang, 永昌大君), born to Queen Inmok in 1606, was eligible to be named Crown Prince even though he was younger than his brothers, because his mother was a Queen rather than a concubine. Throneroom of Changdeokgung Palace, where Gwanghaegun ruled. However, Seonjo was forced to make a decision when he realized he did not have much longer to live, and Prince Yeongchang was still only two years old. Realizing that it would be too long before Yeongchang could rule directly, Seonjo decided to avoid placing the country under the control of a regent, and reconfirmed his original choice of Gwanghae as Crown Prince. The choice split the Northern faction, which held most of the court influence, into two parts, with the Lesser Northerners (小北) supporting Yeongchang and the Greater Northerners(大北) remaining loyal to Seonjo's choice of Gwanghae. Before King Seonjo died, he ordered his advisers to make a royal document naming Gwanghaegun as his official successor to the throne. However, Yoo Young Gyung of the Lesser Northerners faction managed to hide the document and plotted to install Prince Imhae as king, only to be found out by the head of Great Northerners faction (大北), Jeong In-hong. Yoo was executed immediately and Imhaegun was arrested and died the next year. After the incident, Gwanghaegun tried to bring officials from various political and regional background to his court, but his plan was interrupted by Greater Northerners including Yi Yicheom and Jeong In-hong. Then Greater Northerners began to take members of other political factions, especially Lesser Northerners, out of the government. At last in 1613 the Greater Northerners turned their sights on Grand Prince Yeongchang, now seven years old; his grandfather Kim Je-nam was found guilty of treason and executed; and Yeongchang was sent into exile, where he was murdered. In 1618 The Greater Northerners managed to strip Yeongchang's mother, Queen Inmok, of her title and she was imprisoned. Prince Gwanghae did not have the power to stop these events, even though he was the official head of the government. Throne Hall at Changdeokgung Palace. 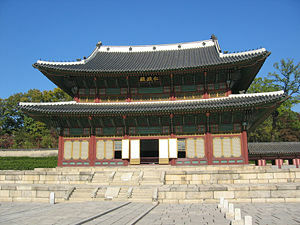 Portions of the palace were burned when Gwanghaegun was deposed. During his father's reign, Prince Gwanghae had already distinguished himself as a military and political leader, defending the city of Incheon and managing national affairs while the King was away on military campaigns. Despite the factional fighting in the court, Prince Gwanghae's talent as a realistic politician allowed him to make some improvements in the country during the early part of his reign. The country was in an impoverished state after the long war with Japan, and many buildings had been destroyed. He endeavored to restore the country and sponsored restoration of documents. As a part of reconstruction, he revised land ordinance and redistributed the land to people; he also ordered rebuilding of Changdeok Palace along with several other palaces. He was also responsible for the reintroduction of the hopae identification system after a long period of disuse. In foreign affairs Gwanghae sought a balance between the Ming Empire and the Manchus. Since he realized Joseon was unable to compete with the Manchu military power, he tried to keep a friendly relationship with the Manchus, while the kingdom was still under the suzerainty of Ming, which angered Ming and dogmatic Confucianist Koreans. However the critically worsened Manchu-Ming relationship forced him to send ten thousand soldiers to aid Ming in 1619. However, the Battle of Sarhu ended in Manchu's overwhelming victory. The Korean General Gang Hong-rip lost two-thirds of his troops and surrendered to Nurhaci. Gwanghae negotiated independently for peace with the Manchus and managed to avoid another war. He also restored diplomatic relationship with Japan in 1609 when he reopened trade with Japan, and he sent his ambassadors to Japan in 1617. During his reign, Gwanghaegun encouraged publishing in order to accelerate reconstruction, to enlighten the citizens and restore the kingdom's former prosperity. Many books came out during his reign, including the famous medical book Donguibogam, and he directed that they be distributed throughout the country. Many historical records destroyed during the war were rewritten in this period. In 1616, tobacco was first introduced to Korea and soon popularized by many aristocratic noblemen. After Gwanghae and General Gang managed to keep Korea from being heavily in the conflict between the Manchus and the Mings in 1619, Gwanghae decided to make a shift in foreign policy to one of non-alignment, a move that angered the Westerners faction, led by Lord Yun Ban. Lord Yun was married to one of King Seonjo's daughters, and the Westerners, were upset at the violence the Great Northerners had committed against Queen Inmok and her young son, and felt they must take retaliatory action. In 1623 the Westerners attacked and burned Changdok Palace, and captured Prince Gwanghae. The coup was over quickly and the Westerners expelled the Great Northerners from power. Gwanghae was confined first on Ganghwa Island (江華島) and then Jeju Island (濟州島), where he died in 1641. He does not have a royal mausoleum like the other Joseon rulers. His and Lady Ryu's remains were buried in a comparatively humble site in Namyangju in Gyeonggi Province. The Westerners faction installed Neungyanggun (綾陽君), the son of Prince Jeongwon, one of Gwanghae's half-brothers, as Injo, the sixteenth king of Joseon and took pro-Ming and anti-Manchu policies, which led to two Manchu invasions. Although Gwanghaegun is one of only two deposed kings who were not restored and given the temple name (the other one being Yeonsangun, the tyrant who greatly contributed to the decline of the nation), many people consider him a victim of feuds between political factions. He did a better job taking care of his country than his predecessor, King Seonjo, who is considered responsible for Seven Year War, or his successor, King Injo, who is blamed for the Manchu Invasion. In modern South Korea, Gwanghaegun is considered a great and wise king, not a despot; his diplomatic skill in keeping Korea from being squashed in the struggle between the Manchus and the Mings was recalled by many people who felt worried about the international situation which included an invisible feud between China and the United States. Many people argued that the South Korean government needs to position itself carefully in order to survive in the changing world and avoid falling like in 1636 when Korea surrendered to Qing Dynasty, or in 1910 when Korea was annexed by Japan. ↑ Richard Rutt, Keith L. Pratt, and James Hoare, Korea: A Historical and Cultural Dictionary (United Kingdom: Routledge, 1999, ISBN 0700704639), 252. Sin, Myŏng-ho. 2004. Joseon royal court culture: ceremonial and daily life. Paju-si, Gyeonggi-do, Korea: Dolbegae Publishers. History of "Gwanghaegun of Joseon"
This page was last modified on 21 July 2017, at 15:22.